Pineapple (Ananas comosus) is a popular tropical fruit that belongs to the Bromeliaceae family and is mainly grown in Asia, Africa and South America. Organic dried pineapple is a superfood snack made ​​from pure, unheated pieces of organic pineapple that have been hand sliced and sun dried in order to retain as many of the valuable nutrients as possible. Pineapple contains zero flavourings, colourings, preservatives or any other artificial additives and is instead bursting with beneficial ingredients including natural fruit sugars, vitamin C, the essential trace element, manganese, and the natural enzyme, bromelain. 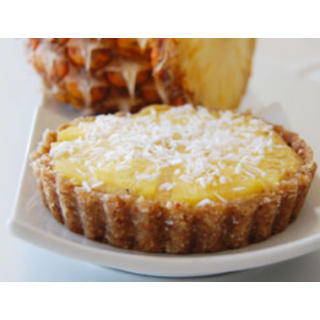 Try pineapple in this fabulous raw recipe with the amazing superfood incan berries. Their flavours compliment each other very well. Pre soak your almonds (preferably for 3 to 4 hours). Put your almonds and the rest of the required ingredients into your blender and blend using the pulsing action. You want consistency that can hold its shape to come out from this. For example roll a bit into a ball and if it can hold you are in the right place. Put this mixture into your tart tin (you can choose to do one big one or individual small ones) and press into the tart tin to mould the shape of the crust. Put into the freezer for at least 1 hour to help it set. 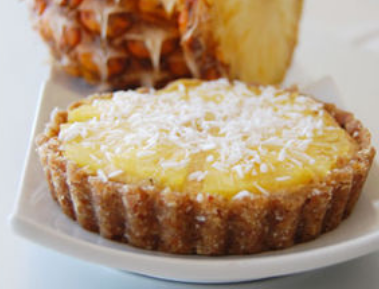 It may be a good idea to rub some coconut oil around the tart tin or use a non-stick tart tin so it is easier to take out. Place all the necessary ingredients into your blender and blend until everything is incorporated together and smooth. After the crust has been in for 1 hour, pour your filling into the crust and decorate with some pineapple slices and a sprinkle of desiccated coconut over the filling.